Super Stella can eat a pancake in a single bite (practically). Sometimes I worry (shocking, I know) that Stella and I don’t venture out often enough for grand adventures. You know, to the Woodland Park Zoo or Pike Place Market. But then I turn on the vacuum or open the refrigerator door, and she goes absolutely bonkers with joy and excitement, and suddenly I’m certain in the knowledge that she gets her share of thrills right here at home. The fridge is by far her favorite destination at the moment. She’s developed a particular fondness for a large bottle of light dijon dressing. If there happens to be some Cava chilling in there (which is often the case), she’ll make a beeline right toward it, and I’ll smile and think to myself that we are incredibly alike. Food and drink remain a big focus of our days. But a shift is underway–a very healthy shift in thinking and eating. Stella is eating plenty of food via bottle, spoon and finger. I think–I really, really think–that she has finally convinced us to chill the F out. Really. This is big, and it’s about time. I mean, on how many occasions has she rebounded from eating “less than usual” to eating “more than usual”? Tons. How many bottles has she drained? Countless. How many Cheerios and pieces of tofu has she stuffed in her mouth? So many that her grocery bill is starting to rival mine and that is really saying something, people. I purchased a horribly edited but very helpful and well intentioned book called Super Baby Food by Ruth Yaron. The purple tome has helped me change Stella’s diet for the better (and by “better” I mean healthier and fresher). The book is frustrating on one hand, because it confusingly cross-references itself to the point of eye-crossing ,book-hurling annoyance, but it’s also empowering in that, by patiently plugging through key parts of the book, I’ve established a real plan for giving Stella a complete, incredibly nutritious, age-appropriate diet. Until recently, I really felt like I was just winging it. I had the feeling I could do better. Also, Stella has enjoyed three nasty colds in as many months, so I’d been wondering if there was a way to boost her immunity, even just a little bit, through her diet. In a nutshell, the book encourages you to make baby food yourself, using lots of “super foods”–not just fresh fruits, vegetables, grains and legumes, but with those that are especially jam-packed with nutrients. At the heart of Super Baby Food is Super Porridge, which should constitute the baby’s biggest and most hearty meal of the day. You make it by throwing grains into a blender (I’ve been using brown rice and millet this week), then cooking them in water. You make a few servings at a time and put them in individual containers in the fridge. Come meal time, you take out a serving of Super Porridge and add stuff to it. In ice cube trays, I’ve frozen portions of pureed fresh vegatables and fruits of the “super” variety (including kale and papaya). So I pop one or two of these veggie/fruit cubes in the porridge and microwave briefly, and mix it up with a bit of flaxseed oil and brewer’s (nutritional) yeast. Every other day, I add an egg yolk to the porridge, per the book’s suggestion. On Sunday, I hardboiled four eggs and put them in a sealed container in the fridge. I eat the egg white as I mash the yolk before dumping it into Stella’s porridge. And the shocking thing is, she likes it. She really really likes this porridge stuff. Her favorite seems to be Super Porridge with a cube of mashed avocado, a cube of mashed papaya and an egg yolk (the flax and yeast are givens). I make an effort to prepare the porridge in a way that is appetizing. I’m not down with making her food that is nutritious but unappealing–what fun is that? According to the book, yogurt has enormous health benefits (big revelation there, right?) and should be the base of one meal per day. I haven’t full-on incorporated this into our routine yet, because Stella is not supposed to have dairy until one year of age. However, I do stir some rice yogurt into her morning fruit meal, and I plan to grab some soy yogurt at the grocery store. I’ll probably do my bowels a favor (I owe them one after months of Pagliacci Pizza, RoRo’s BBQ and Mighty O donut dependence) and stock up on some Greek yogurt for myself. Super Porridge may sound a little crazy and, well, it is–when you compare it to our old mode of using Earth’s Best jarred baby food and cereal (which I still use here and there as I am not going to become militant about what Stella eats and want her to enjoy a wide variety of foods). 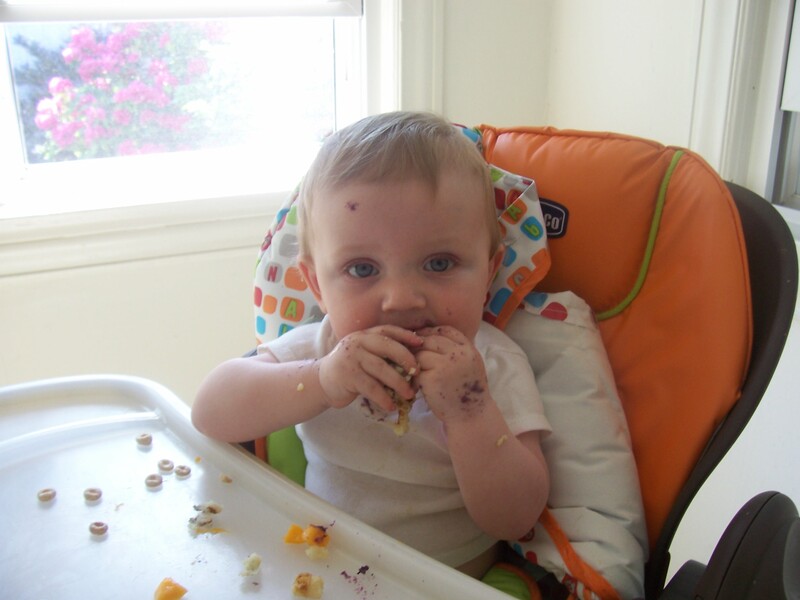 Super Baby Food isn’t exactly “simple.” But the level of effort wasn’t too excruciating this first week. I get the sense that in another week or two, I’ll be in the flow of it, making only small batches here and there. I expect this plan to become a habit that doesn’t require the current level of thinking and deciphering. Besides, I feel so good about feeding Stella this way. I love knowing that even on days when Stella doesn’t eat much, each bite she takes is off-the-charts nourishing. At times I still want to chuck the book out a window because it’s such a convoluted read, but I am really grateful for the hearty bits of wisdom nestled within pages full of rampant bolding and italics, near-criminal use of indentation, and random tangents and unneccessary side notes. All told, I love the book and how it’s enabled me to boost the quality of Stella’s daily meals. Maybe it’s because we visited Stella’s OT last week for pointers. Maybe it’s the weather or my improved attitude rubbing off on Stella. Maybe it’s a growth spurt or her new homemade super food. Perhaps it’s all of the above. For whatever reason, Stella is chowing down. She seems to enjoy eating more than ever before. I’ve said this before many times. But maybe now, after all these months, we can stop the counting and obsessing and begin a new era of enjoyment. It would be as nourishing for Stella, and myself, as anything I can put in a bowl or bottle. This entry was posted in Baby food, Lessons in parenting, Life with a baby, Milestones and tagged awesomeness, baby, Baby food, brewer's yeast for babies, cava, flaxseed oil for babies, homemade baby food, infant, infant nutrition, jane iredale foundation, mighty o donuts, motherhood, ng tube weaning success, nine months old, occupational therapy, pagliacci pizza, roro's bbq, spoon feeding, Super Baby Food, tube weaning success, wisdom, yogurt. Bookmark the permalink. Hey Amber! I ran across your email with your blog about Stella. Look at her eat! You have worked so hard and she is so beautiful. Congratulations! she is so sweet! i love the name Stella. And all because you let go and trusted Stella. Wow. Go Stella and her parents!! Another book you might love (it is a fun read) is Jessica Seinfeld’s Deceptively Delicious. It is geared for older kids and grown ups, but I love the concepts. I now make lots of purees and throw them in everything I can think of. I make most of Sarah’s orange baby food (carrots, squash, sweet pot.) and buy the peas, beans, and applesauce. I mix everything with some rice or oat cereal, or instant mashed potatoes to give it some more body. She is loving it! She also likes mashed bananas. I could never have done this with Libby though, when I invested too much energy in food and she didn’t eat it I was devestated…okay, still am devestated!